Rowing events take many forms. From local fun competitions such as Scratch Regattas all the way up to the international multi-lane regattas at the Olympic and Paralympic Games. Possibly the most recognised form of rowing event, regattas are traditionally held in the warmer summer months. Regattas come in a huge range of styles, sizes and distances. From local town regattas or private matches to national and international competitions. Below are a few of the different forms that regattas can take. If you’ve ever watched an Olympic or Paralympic Regatta, this is the type of regatta you’ll have seen. Usually raced over a distance of 2000m with traditionally six lanes of crews. The larger national regattas and national championships are all multi-lane regattas. All international competitions are held on a multi-lane course with many being purpose-built venues such as Dorney Lake in Eton, Holme Pierrepont in Nottingham and Strathclyde Park in Glasgow. Side-by-side racing is where crews will race one on one. As most regattas are held on fairly narrow stretches of river, most regattas are raced in this format. Distances can vary from 400m to longer races such as the famous Henley Royal Regatta held over 2,112m. Most side-by-side regattas are open regattas, open to anyone to enter. Some, however, are private matches held between two or sometimes three clubs. The most famous of which is the University Boat Races held on the River Thames between Oxford University and Cambridge University. Using Surf Boats, crews start side-by-side in knee-high water racing straight out to sea and around a buoy located a minimum of 400m off the beach. Crews then race back to the beach and finish with a member of the crew running across the finish line on land. A new style of event similar to that of Surf Rowing but in FISA Coastal Boats. In this format, two teams start on a beach and run to their boats. Crews then row out to sea around a buoy located no further than 250m from the beach and back. This form of event was created to help support the development of the sport in nations that do not have access to calm waters. Coastal regattas are held parallel to the coastline over a course distance of between 11/2 miles to 2 miles. In these races, crews will race towards a turning buoy and back with the start and finish line being the in the same location. Offshore and Fixed Seat regattas are generally much longer than a river regatta, with racing over distances of up to 6km. Crews start either from a beach or in open water and race out to a series of turning buoys. The crews will race around the course in open water and finish either on the beach or between two finishing buoys. Head racing takes the form of time trials held over longer courses than that of regattas. Head racing initially started as a way for crews to keep a focus on their training during the colder and darker period over winter. Crews set off one at a time and are timed from start to finish. 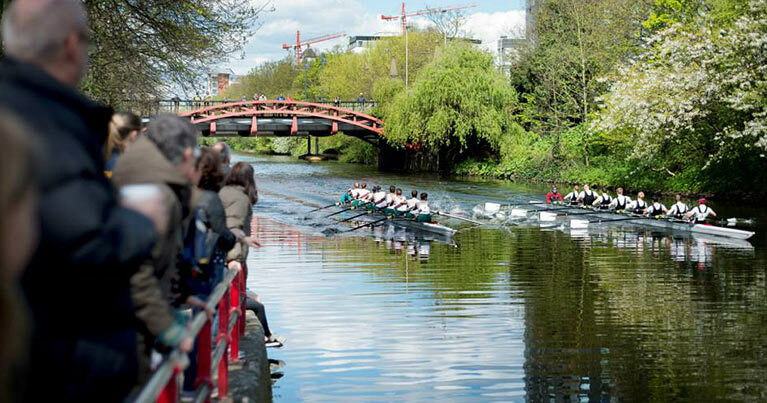 The largest of this form of event in the UK is the Annual Head of the River Race, first held in 1925, regularly attracting up to 420 men’s eights from the UK and Internationally. Touring and Recreational rowing is offered by many clubs across the country as a great alternative to competitive rowing. Both offer the opportunity to get a group of people out on the water to explore a new area by boat and is generally done in more stable boats. Tours can be of any length, from a few hours to a few days, or even a week. For touring, you need to have some rowing experience and a good level of fitness, particularly if you are covering longer distances. The beauty of touring is that everyone gets a chance to row and to cox on scenic stretches of water. These type of events can be easily described as events that challenge the rower. Events are generally held over much longer courses and are unique in their concept. The Boston Marathon, for example, is held over 50km and is unique in that crews must carry their boat over a lock at a certain point of the course. Other events focus more on the fun and frivolity of the event and can be compared to mass participation running events. Events such as this include the Great River Race held on the Thames or the Great Tyne Row held over 25km of the River Tyne. Usually held with minimal structure and with committee boats (boats provided by the host). These events have grown in popularity since the growth of stable boats in clubs. Many clubs now host scratch regattas where rowers are drawn in random crews to race each other or clubs enter a team to take part in multiple rounds over a much shorter distance. Some events are timed and can include skill stations around the course where crews have to perform a skill to progress. Popular events include the Explore Series which originated in the North East of England and Bradford RC’s “War of the Roses” regatta.